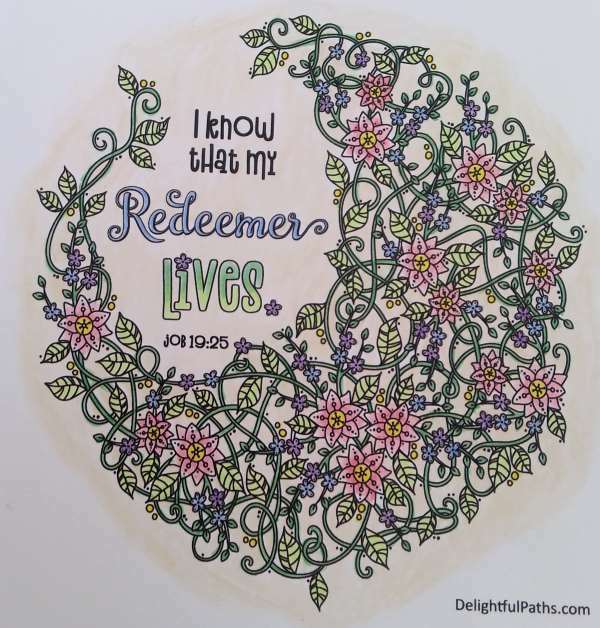 My Redeemer Lives Bible verse coloring page with an intricate floral frame from Job 19:25. 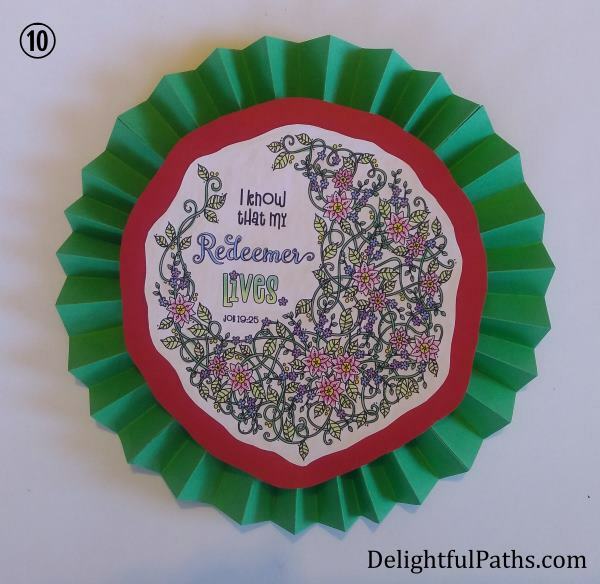 I love to think of ways that I can use my pages after they have been colored, so I have included a couple of ideas in this post – an Easter card and a hanging decoration. The truth is, some time after I had photographed the card, it somehow got some water spilled on the bottom of the card, discoloring and warping it. So I removed the topper and converted it into a decoration :-). This page could be printed out full-size, colored then placed in a frame and you’re done. Color the picture with your preferred media. Roughly cut around the outside of the picture. Choose a piece of card which picks out one of the colors you used to color the picture. I chose red to match the large flowers. Mount the cut out picture on this piece of card, making sure to leave space for a margin around it. Roughly cut out the colored card leaving your margin. I left a margin of about half an inch (1 cm). Fold another piece of card in half to form a card. You could use A4 or 8.5″ x 11″. Mount some lace on the front of your card. Mount your colored picture so that it sticks up over the top of the card a bit. 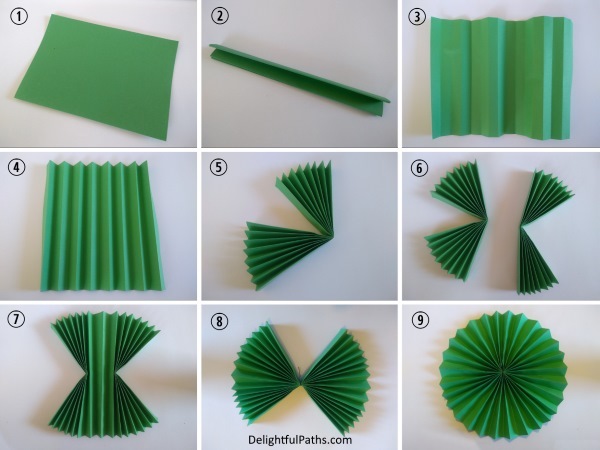 Fold a piece of colored paper in half (short end to short end) as accurately as you can. Fold in half the same way again three times until you end up with a long narrow rectangle. Use the fold lines to accordion fold the page. Squeeze the folds together and fold in half lengthwise. Repeat with the second piece of paper. Stick the two sides of the rosette together. Stick the sides together to form a circle. Try to line up well around the outside of the circle. The inside isn’t as important because you will be covering this. Attach your colored picture to the front of the rosette and attach a piece of ribbon or string to the back to hang the decoration by. Subscribe (free!) 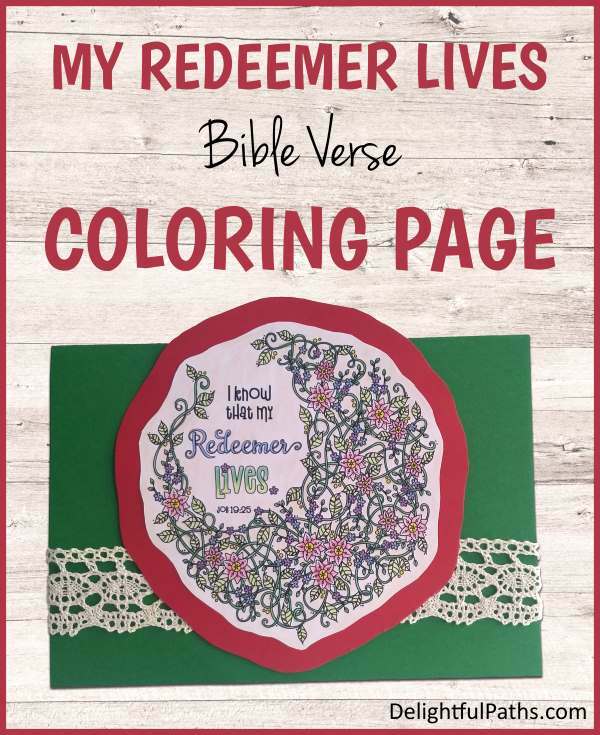 to get access to the My Redeemer Lives coloring page (as well as my whole resource library with all my coloring crafts and printables!) Once subscribed, I will send you a semi-regular newsletter with details about my new free files, occasional offers, and other things you may be interested in.